Scissors are scissors, right? Wrong! Ask any seamstress or crafty person and they will tell you that they have multiple scissors for multiple projects. They have their paper scissors, their fabric scissors and their wire cutters. All scissors in the basic form of the word but all different. You never ever cut paper with fabric scissors. That is the biggest no-no in the craft world! Cross stitch projects are the same way. You need to choose the proper scissor for the project. Let's start with the cloth you are going to cut. You will want a good pair of fabric/sewing scissors. There are a few things to consider when buying fabric scissors and the first being invest is a good solid pair of scissors. If taken care of, these scissors will last for generations. There are two great companies for fabric only scissors. One being Gingher Knife Edge Scissors. They are able to cut through thick cloth like aida, multiple layers of fabric or something thin as silk. They are a little bit expensive but worth it. They are very sturdy and with sharpening, will last a life time. The other popular brand is Fiskars. Everyone knows the orange handled scissors by Fiskars. They are a staple in every area from crafting, sewing to gardening. You can get a cheaper set of scissors from Fiskars but if you want them to last, spend a little cash. Another tip for fabric scissors, label them! Use your fabric scissors for only cutting fabric. One reason for this is any other type of cutting will dull the scissors more and may damage the blade. Both Fiskars and Gingher have a plethora of information about the use and upkeep of scissors. You have your fabric cut, now you need to cut the floss. Believe it or not, you need a set of scissors for that too. Every cross stitcher has those fabulous stork scissors. They are perfect for cutting floss. You want skinny small scissors for floss. One reason to use smaller scissors with pointed ends is if you make a mistake, you can easily cut the floss out of the fabric. It is almost like two tools in one. Some people prefer to use curved scissors instead of the long pointed ones. There is no benefit, just preference. Again, you want to keep these sharp and invest in a good pair that will last you. A good pair of sharp embroidery scissors will cut the floss and not pull it. We all know how badly cut floss is a pain to thread. Gingher also makes stork scissors and smaller embroidery scissors. The Silver Needle has an amazing collection of scissors including Dovo's, which are very popular and have many designs. The one thing to remember about embroidery scissors is to have enough room between your hand and the point of the scissor. Longer is not better, but add a little bit of length for easy maneuvering. The last tip about scissors is the upkeep. Sharpening, oiling and proper storage is imperative. Doing all of these steps will ensure that your scissors will last. Another tip to think about is for you lefties. Please invest in a good pair of left handed scissors. It will save you time and headaches. Lefty's Left Hand has a great selection of left handed scissor from fabric to smaller embroidery size. Having the proper tools to complete a project is essential. You certainly wouldn't build a house with nails and shoe would you? So why do that with your projects? The proper tools will ensure that your cross stitch project will go smoothly. Keep your paper scissors on the desk and your fabric scissors beside your cross stitch fabric. Label all of your scissors so friends and family know which ones to use and there will be no confusion. 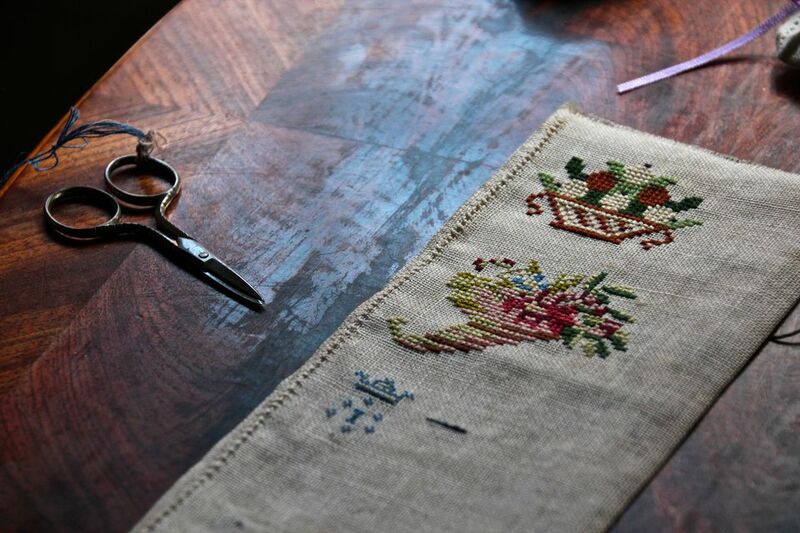 You are creating something that will last ages and having the proper scissors can help make that cross stitch perfect.